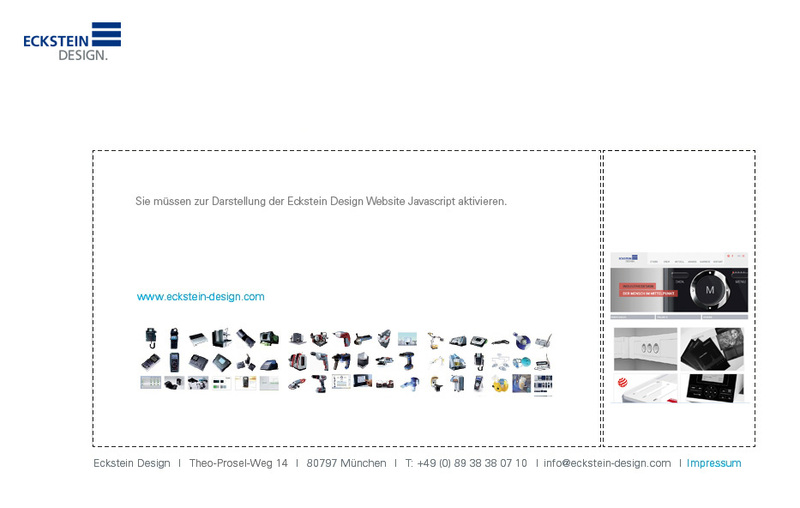 Eckstein Design / Designbüro für Industrie-, Interface-, und Kommunikationsdesign München. Unlike cryotherapy, which uses cold temperatures to ablate tissue, thermo coagulation uses heat to destroy tissue. The technology has a clinical appeal because it is user-friendly, inexpensive, and durable. The system runs entirely on electrical power and requires no gas to operate. The treatment is fast, easy to learn and the equipment has a low dependency on a service infrastructure.The treatment requires generally no local anaesthesia and is administered within a very short treatment cycle (< 2 Minutes). The device is fairly simple to use and does not require long enduring and costly training for an operator to understand how it is done properly. Other features are the LED illumination for a better visibility and the heat protection for a safe and painless entry. The ergonomics of the handgrip and the resettable heat protection were optimized by the Eckstein Design team in several studies. Even after hours the coagulator rests comfortably in the hand and achieves a good and precise result. An intelligently placed user interface allows to keep an eye on all important functions. VDW.CONNECT combines modern communications technology with high performance. The innovative wireless endo motor VDW.CONNECT Drive offers great portability and simple handling for the user. It provides basic functionality or the flexibility to access a wide range of process-relevant applications via VDW.CONNECT App. Freedom of movement, intuitive control and individual profiles offer the highest possible versatility and efficiency. The new concept is future-proof - VDW.CONNECT is updateable and modular for expandable functions and services. The result is state-of-the-art technology - always. The eFlow® CS inhalation device impresses with its short treatment times, noiseless operation and high portability. It combines innovative piezoelectric membrane technology with disposable medicine vials. Several user studies informed the design process, which took into great consideration the ergonomic needs of the target group (elderly patients, partly with handicaps). The design supports intuitive handling and helps to avoid misuse. Buzz Digital OR is a central information terminal for the operating room. Incorporating 42" multi-touch screens, the computer and IP-based system offers intuitive interaction for effective data management in the OR. Buzz provides a high degree of flexibility for medical staff and simplifies the information flow in an increasingly complex OR environment. Minimal installation depth and a streamlined yet generous look make the best use of the OR's limited space. The iTray digital scanner operates on an entirely new kind of technology that gives the scanner an advantage when it comes to oral impression: the relative positions of the upper and lower jaw are automatically recorded. We used ergonomics and grip qualities to inform the design for this innovative impression tray, conveying its operating principles through a clear, streamlined style and using high-quality materials to craft a perfect and organic whole. An OLED display shows the progress of the scan. The Android articulator developed by Medentic is a high-precision apparatus that mimics the human jaw in both structure and function to facilitate the fabrication of dentures in the lab. It is fully adjustable to accommodate all settings, such as Bennett angle, condylar inclination angle or hinge axis. With this data, the movement of the jaw can subsequently be simulated. The design's style and light-weight and top quality choice of materials supports the articulator's ergonomic geometry. This retraction capsule was developed for the artificial retraction of gingiva from the tooth neck. By using contrasts of matte and glossy surfaces, but also relief-like height differences, it renders the impression of a high-quality product at first glance. The cylindrical shape with rounded edges provides pleasant haptics and a well-controlled grip. The asymmetric fin underlines the friendly character of the capsule. Upon retraction, the tapered and elongated capsule tip can be easily inserted into the sulcus without injury. The conical geometry allows for easy mechanical displacement of the tissue. In addition, the attached orientation ring simplifies precise intra-oral handling. The dispensing system of the Scotchbond Universal Adhesive simplifies workflow in modern dentistry and leads to optimised results. The reduced form of the vial body with high-contrast colour variations culminates in the sweeping curves of the deep blue, extra-large locking lever. This enables intuitive, one-handed use of the product. Moreover, the swing lid features a bistable film hinge that locks into a stretched dispensing position when the lid is opened. This ensures an unhindered view of the vial tip for precise dosage during application. An audible clicking sound indicates the closing of the vial, thus protecting the adhesive. The Multiplate® Analyzer quickly determines platelet function for the diagnosis of plasma coagulation. The analyzer is used primarily in cardiology, surgery and intensive medicine. The high medical value of the system is a result of its convincing ergonomic concept, visible in its clear and reduced shapes. The eFlow Rapid and Altera inhalation systems are innovative devices for treating respiratory illnesses. They were developed to meet the patient's need for efficient, safe and above all rapid nebulizer treatment. The separate, detachable mouth piece ensures perfect nebulizer hygiene. The portable ultrasonic system eZono 3000 was designed to meet the demands of clinical point of care services. The main unit is a high-grade flexible hardware platform connected to a powerful processing platform. The display's large surface means it can be used surely and easily. The unit has a direct handle for optimal handling in mobile situations. Reflector technology, ergonomics and adaptability were the main goals for the new development of these OR lights. These lights are a step ahead with their distinctive non-blinding, ergonomic and optimal handling properties for medical examinations. VectorVision² is a multi-function control system for use in neurosurgery and orthopedic treatments. During conception and design, we placed special emphasis on creating a user-based design where settings can be configured to a particular workspace at any moment. PARI BOY is an inhalation device for treating respiratory illnesses. The friendly design, shaped like a drop, is intended to reduce any reservations patients might have about therapy treatment. The nebulizer is easy to use and makes inhalation treatment simple enough for children, and the "Drobby" character also adds an element of fun. For the Sorin group, we created the C5 heart-lung machine based on a modular principle. The new system is appreciated for its well-conceived structure and functional, ergonomic design. The solid, stainless steel body reflects the product's high quality. The C5 system's easy-to-access monitor functions enable a perfect workflow for the perfusionist. Priority was given to reducing the unit's outer dimensions in order to adapt to the spatial limitations of very small operating rooms. The entry-level VDW Silver and high-end VDW Gold are two top-quality endodontia devices for the treatment of root canals. An intuitive menu navigation system with few buttons, the clear user interface and a generous display make the device easy to operate. Radio surgery system for non-invasive, precision treatment of tumors or vascular malformations using high-energy radiation.